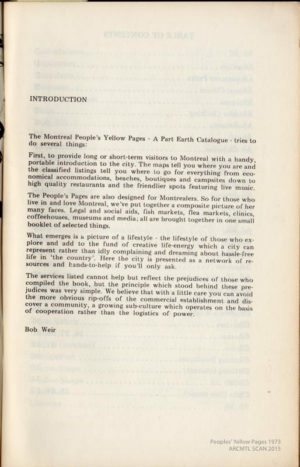 The Peoples’ Yellow Pages, an unabashed guide to Montreal for those interested in alternative and underground lifestyles was published annually from the early to mid 1970s in Montreal. Louis Rastelli interviewed its editor, Garth Gilker, at his Café Santropol in October 2015. 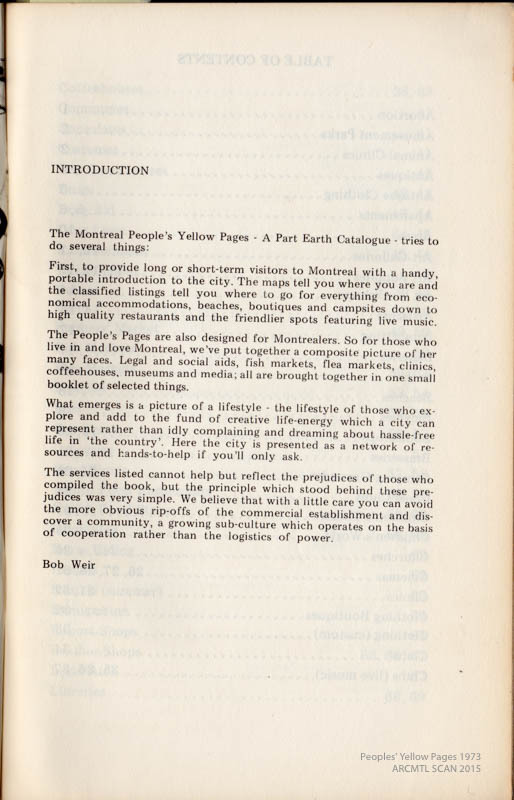 This Plateau Mont-Royal institution, begun shortly after Gilker ceased publishing the Peoples’ Yellow Pages, celebrated its 40th anniversary in the summer of 2016. 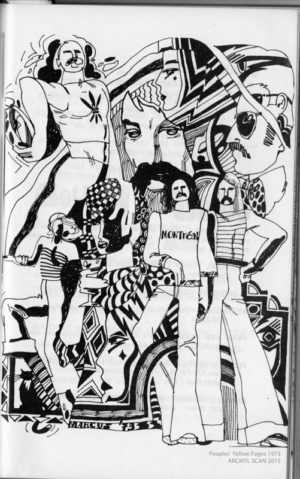 Gilker, also known for his long acting career, recounted his early years in the city and how he went about cataloguing the city’s alternative side as it blossomed between the summers of Expo 67 and the 1976 Olympics. Full issues of the Peoples’ Yellow Pages as scanned by ARCMTL in 2015 are available here on this site. GG: I’m a Gaspesian from New Carlisle, same town as René Lévesque, but he was much older than me, more like my father’s age. My parents knew him, and I still have a cottage there on the same street that his house was on. My whole family, my parents and the 6 kids all moved here, so that we could live at home and afford to go to university. We ended up in St-Lambert. My father was a livestock inspector, and the abattoir was down on Bridge Street, just where the Costco now is on Bridge & Mill, which was a short drive to the Victoria Bridge, which is why we ended up in St-Lambert. This was in the early ‘60s– there were 10 of us, because 2 of my brothers friend’s came up with them to help. We all lived in one apartment, a 5 ½… 10 of us and one dog. I now live in a 5½ by myself (laughs). I’m fortunate to have all of that space to myself; trust me, I still appreciate it. 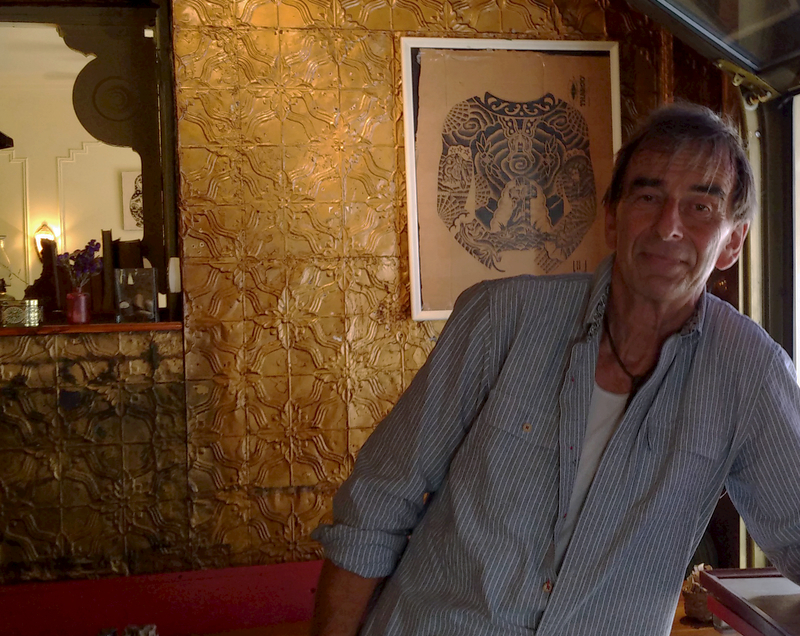 Garth Gilker at the café he opened in 1976 (and still operates), Santropol. Photo by Louis Rastelli. LR: Did you go to high school in St-Lambert? GG: Yup, but later we moved to the town of Le Moyne, which is now part of Longueuil. That town was only about 5 streets wide and 4 blocks long (laughs). LR: When did you start going downtown? GG: Expo 67 is when I started coming in to the city more often, as a teenager. 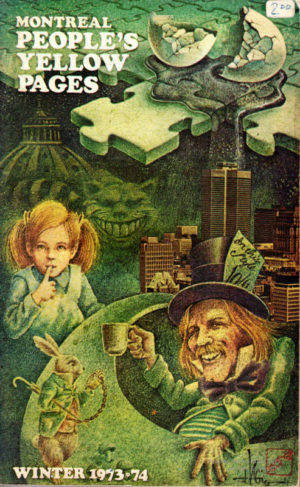 I worked at Expo from ’67 to ’69. LR: Did you see any of the musical acts or concerts at Expo 67 or Man And His World? GG: I pretty much just worked while I was there. I was a taxi driver on the site, in a golf cart. I ended up contracting out to restaurants, so when tourist asked me where to eat, I had already lined up a number of restaurants that would give me free meals if I brought in customers. Then later, I had a group of taxi drivers doing this. There used to be a clock with a little flag on it that looked like a meter, but people didn’t know it wasn’t a meter. We had all sorts of scams going on. At one point Mayor Drapeau had every one of us arrested, we went to the jail for x-number of hours– yes there was a jail at Expo! Us Expo taxi drivers were so out-of-control! (laughs). That was in ’68. In ’67 I was the dispatcher for all of the La Balades, the trains that drove people around. I would keep track of how many people were coming through the different entrances and I would send La Balades out to them. I would also do the night work at re-assembling the Balades trains when they would get damaged or have flat tires, you had the tractor and you always had to have the B and C carriages follow them, you could never put two B’s or two C’s on. So I lived there! My office was across from the American pavilion, my little kiosk, where I was dispatching everything. I would stay there all night… it was like being in a fantasy land, it was wonderful. That’s where I really starting seeing that there was another world out there. Us employees had our own places to eat and shower and stuff. LR: There were a lot of hostesses too. Was there a lot of camaraderie? GG: Oh yeah! I remember in ’67, meeting the hostesses from Czechoslovakia and I remember doing the same in ’68, and it was like night & day! Because the revolution had happened in the meantime (Prague Spring). Theirs was one of the most raved about pavilions, they were so proud of their glasswork and their steelwork, the enthusiasm was just bubbling out of all of them. And then in 1968, they were crying, it was like going from a new beginning for their country to the complete opposite. Expo 67 was such a cultural celebration, the Olympics were a complete nightmare, just the opposite, they had nothing to do with culture… The people that visited were only interested in buying ashtrays with Olympic logos on it, whereas at Expo you would have shops selling carvings that they were carving there right on site. GG: It most likely exposed me to… that there was a world out there, and it was after that, that even I went off to Europe. My father was always into gardening, even though he was a livestock inspector, he should have been a plant pathologist honestly… so I always had an interest in like the gardens and spaces… but it was Expo 67 that taught me that man could duplicate nature in gardening… they couldn’t fill the landscape that they had created, they didn’t have enough pavilions so all the south-side of Ile-Notre-Dame was landscaped and made into miniature lands, like duplications of different landscapes of Canada. Out in the lakes you used to have rocky islands that represented the rocky islands off the coast of Newfoundland and stuff. I remember going out there and was highly impressed with the fact that you could change some because it was all rubble from the Metro and how you could take that rubble and make it into a green-space, that’s where I first saw that! It ended up inspiring me. I ended up digging up the back vacant lot and gardening here (at the Santropol restaurant). In ’68 I made enough money working in the summer to hitch-hike through Europe for a year! That’s where I got the idea for the People’s Yellow Pages, in Amsterdam. When I came back, my cousin had come up from the Gaspé and was living in a condemned building down on Des Seigneurs just below the tracks in Little Burgundy. It cost $45 a month, which made me realize that I could afford that… I bicycled into this neighbourhood (Plateau Mont-Royal) one summer night and it reminded me of Europe, at that time there was a lot of Greeks here. I had spent over three months in Greece, so I was like “Wow! I’m gonna have to live in this area.” There were a lot of bakeries and places you would never see in St-Lambert, so I got an apartment on Coloniale where everybody usually ended up getting cheap apartments. In fact, I did have to leave in the middle of the night, even though it was cheap back then, I ended up not being able to afford the place at one point. LR: Did you hang out at any particular places downtown back then? GG: I knew Rockhead’s, because once my cousin was renting in Little Burgundy, I would come over, we would drink and I would never make it back to the suburbs. The place I remember the most was The Love on Guy Street, right across from The Stork Club, it was up on the second floor and was a dance place. But that was more in the early ‘70s. The Stork Club was a beautiful place inside before somebody turned it into more of a contemporary bar… Even the tables were illuminated from underneath with storks engraved into the glass. It was really a nice old place, of the old-school, old-style bars.